Have a look at pictures of the event here! Waterlow Park was the setting for our second Lark In The Park, held on September 17 to celebrate the 125th Anniversary of the original opening of the park in 1891. The event got off to a rousing start with a procession down Highgate High Street led by a brass band followed by local primary school children bringing gifts of plants for a commemorative flowerbed. The Mayor of Camden, Lord Avebury (the great grandson of the Chairman of the LCC who opened the Park in 1891), the Chief Commoner, the Master of the Worshipful Company of Stationers, and the current Baronet, Sir Chris Waterlow (who is the great great great grandson of the benefactor of the Park) all joined in a re-dedication of the Park. The fete was then "formally" opened by TV's Paul Whitehouse. The main events on the stage consisted of tableaux based on the history of the Park - performed by local primary schoolchildren - as well as our own Highgate Choral Society, the North London Brass, the Pearly Queens of Kings Cross & St Pancras. Throughout the afternoon there were traditional stalls and plenty of food and drink. A one-man band entertained visitors and, for the more energetic, there were giant kids' games, fairground stalls and maypole dancing. Thanks to everyone who helped the Friends of Waterlow Park put on this event and to all those people who came and made it such a success - we could not have done it without you! We are most grateful for the support of all our sponsors - lead sponsor Goldschmidt & Howland, Big Lottery Fund, Camden Council, Ernest Cook Trust and Stationers’ Company Fund - as well as the help and support of the local Parents' Associations, Amenity Groups, Highgate retailers and a cast of dozens of volunteers who have helped make this Waterlow Park 125th year celebration possible. It is best to come to the Park by public transport or on foot [into the Highgate High Street Park entrance] but remember that there is no tube service on the High Barnet Branch of the Northern line this weekend north of Archway. The traffic will also be disrupted as there is resurfacing work on the Northbound A1 north of Archway roundabout. Several buses will be diverted up through Highgate Village [see Transport for London for more information]. Waterlow Park will be the setting for the September 17 Village Fête, called Lark in the Park, being held to celebrate the original opening day of the park in 1891, 125 years ago. The event will get off to a resounding start with a processionat 11.30 down Highgate High Street led by a brass band followed by hundreds of local primary school children bringing gifts of plants for the Park. These will be planted in a commemorative flowerbed, designed by one of the local six primary schools. To echo the original 1891 opening ceremony attended by Sir Sydney who was both a Lord Mayor and Master of the Stationers’ Company, Sir Christopher Waterlow, Sir Sydney’s direct descendant will be joined on stage at the opening ceremony by Lord Avebury, the great grandson of Sir John Lubbock of the London County Council, who originally opened the park, the Lady Major of Camden, the Chief Commoner of the City of London, and the Master of the Stationers’ Company. Paul Whitehouse will cut the tape to open the Village Fete. The day will feature traditional fête attractions such as stalls selling local produce, a Tombola, Bric a Brac stall, cakes cakes cakes and Donkey Rides. There will also be lots of Victorian funfair stalls – such as Ball in the Bucket and a Coconut Shy and free giant-size children’s games from that era and a Magic Lantern show about the Waterlows. 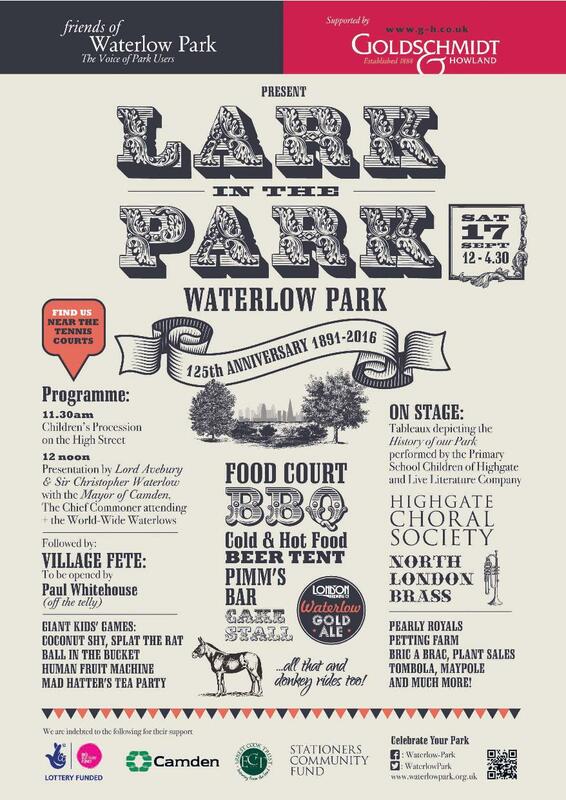 There will be six plays on the history behind the park performed by local schoolchildren and Live Literature Company and performances by a variety of musical entertainers, including Pearly Royals, North London Brass and Highgate Choral Society. The winners of the Waterlow 125 Photography Competition will be presented with their prizes. To sustain you through all this amazing entertainment there will be a Beer Tent with the famous Waterlow Gold beer, a Pimm’s Bar, and hot and cold foody treats. Lark in the Park opens 12 midday after the procession and closes at 4.30pm, Saturday 17th September. Entry is free. Supported by: lead sponsor Goldschmidt & Howland, Big Lottery Fund, Camden Council, Ernest Cook Trust and Stationers’ Company Fund. Local parents associations, Amenity Groups, Highgate retailers and a cast of dozens of volunteers have helped Friends of Waterlow Park make this Waterlow Park 125th year celebration possible. Follow our Twitter for updates. We are pleased to share these beautiful mugs, commissioned by the Friends of Waterlow Park to celebrate its 125th anniversary. The mugs are made in an attractive white bone china and feature a commemorative design. They would make a perfect gift and serve as an excellent reminder of the park's long history. The mugs can be purchased from FoWP Committee Members or via the website below. They are priced at £6 for one, and £10 for two. We are happy to be able to offer free delivery in the N6 postal area. Deliveries outside of this area are charged at £2.50. Support the Friends of Waterlow Park and celebrate the 125th anniversary of the park at the same time! As part of the ongoing 2016 commemoration of the opening of Waterlow Park in 1891 - a gift from Sir Sydney Waterlow to be ‘a garden for the gardenless’ - Friends of Waterlow Park are running a photography competition on the theme of Waterlow Park Life. We have asked for for photographs that capture the essence of life in Waterlow Park now or in the past. For six months between February and July, a top photo was be published in the Ham&High. All these photos can be viewed here along with information on the final winner!